I remember when we engaged the services of a Peninsula-based Renewable Energy consulting company in 2011 in anticipation of the FiT scheme set to be implemented beginning 2012, everyone was very excited about the prospect of second source of revenue for the company. The potential was to install at least 700kWp of solar PV each at several existing structures under our jurisdiction. Indications are very much pointing to a total capacity of 2 MW. In the end we learnt that the quota for non-individual Solar PV was snapped within the first couple of hours of the opening of online bidding carried out by SEDA Malaysia. Later we found out that a JV between Sabah Energy Corp. and SESB secured portion of the quota and news were going around that they were set to build the first commercial solar farm in Sabah. Sadly, until today this has not materialised yet partly because FiT for Renewable Energy was suspended indefinately in Sabah. No. Not until we start paying the 1% levy on our electricity bills! A the moment, renewable energy (RE) producers in Sabah, mostly biomass and biogas plant operators at palm oil mills, are not able to subscribe to the feed-in tariff (FiT). Unlike in Peninsular Malaysia, RE producers in Sabah have to be contented with TNB's Small Renewable Energy Projects (SREP) rate of 21 sen per kWh, instead of the 32 sen per kWh under the FiT. This is because under the law, RE producers in Sabah will only be eligible for FiT when the 1% RE levy is collected by Sabah Electricity Sdn Bhd, a 70% subsidiary of TNB, from heavy power users in Sabah. Since December 2011, heavy power users in Peninsular Malaysia using more than 350kWh or whose monthly bills exceed RM77, have been paying the one per cent RE levy to TNB. The Sabah government, however, had appealed against collection of RE levy, saying it would be too taxing on heavy power users here. Now that it has been over a year, the federal government indicated that the Sabah government seemed to have come around. Business Times reported on March 27, 2013 that Energy, Green Technology and Water Ministry secretary general Datuk Loo Took Gee as saying "the Sabah government has verbally agreed, we met up this week." She was speaking to reporters after representing Energy, Green Technology and Water Minister Datuk Seri Peter Chin in officiating at the launch of the Eco-B workshop organised by Malaysia Green Building Confederation. Asked when Sabah Chief Minister Datuk Seri Musa Aman will sign on and allow TNB to collect RE levy from heavy power users in Sabah, Loo replied: "We'll have to wait for the official letter from the Sabah state government". TheGreenMechanics: Why not. With the implementation of the FiT scheme in Sabah, we'll get to enjoy the premium rates of, say, electricity generated from solar PV on our rooftops. (1) will Sabah FiT tariff start fresh like 2011 or just follow the current FiT rate? With 20% degression rate for PV there is no profit for power plant. (2) Will Sabah applications, especially for PV, fight the same quota allocation with semananjung? I guess it will be hard for the local to compete as we are so far from SEDA. The PV system price in Sabah will still be much higher than semananjung as we don't have the volume yet. 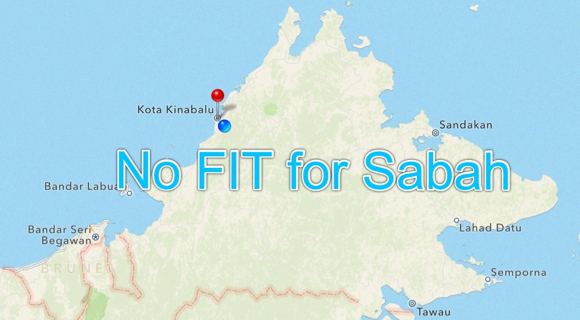 I guess even if FiT is coming to Sabah the interest from the local, personal and company, will be less still. Thank you! 1) I dont think the tariff will (and it should not) start fresh, that's the price for the indecision on the part of the leaders. Degression is a bit steep now but I believe SEDA have taken into account the big drop in solar panel prices. 2) The bidding system being computerised and online, everyone should have equal chance of getting small slice of the cake. No human intervention is allowed but I can understand the worries, human can still temper with the algorithm; hopefully this is not the case. If and when the FiT comes to Sabah, I wouldn't mind being the first to alert my higher-ups to study the risk and grab the opportunity. What is small hydro? Does that mean I can install any small dynamo somewhere and sell power to TNB? Small hydro (in Malaysia) refers to Hydroelectric installations with the capacity of less than 30MW. Example is the proposed 9.5 MW Mini Hydropower plants in Tuaran.